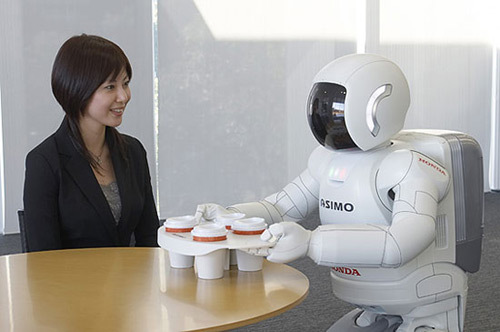 Look, I’m not questioning Japan’s prerogative to host an international robot dance off. If anything, such a thing seems par for the batshit crazy course. HOWEVER, I do question why anyone would want to bring us one step closer to the demise of mankind; or, for that matter, why they’d put said step towards our collective annihilation in a schoolgirl outfit. That’s just irresponsible. And gross. Sure, she may have only been programmed to dance, and I get that it’s not really dancing so much as lurching about like she’s had one too many lycheetinis and a half a tab of Vicodin for good measure, but that doesn’t mean those dance moves won’t one day be used to KILL. After all, we all know that robots run on battery power and ruthless ambition, and adding dancing to this equation will just make those robots younger and hungrier when coming down the metaphorical stairs of human extinction. Really, Japan, it’s just like that saying goes: those who cannot learn from Showgirls are doomed to repeat it. Just thought you should know before you doom us all to roboblivion. Cheers to Videogum for sharing this unimaginable horror. This entry was posted on Tuesday, December 1st, 2009 at 3:23 pm and is filed under News, Random Things and Video. Tagged: Asimo, Batshit Crazy, Dancing, Japan, Nerd Things, Nightmares, Ridicudancing, ROBO-ONE GATE, Robot Apocalypse, Robots, Showgirls. You can feed this entry. You can leave a response, or trackback from your own site. The things you do for our sake, dear Ben! I will most definetely have terrifying nightmares now! God bless you my child for all the horror! It’s the damn vending machine you have to watch out for..